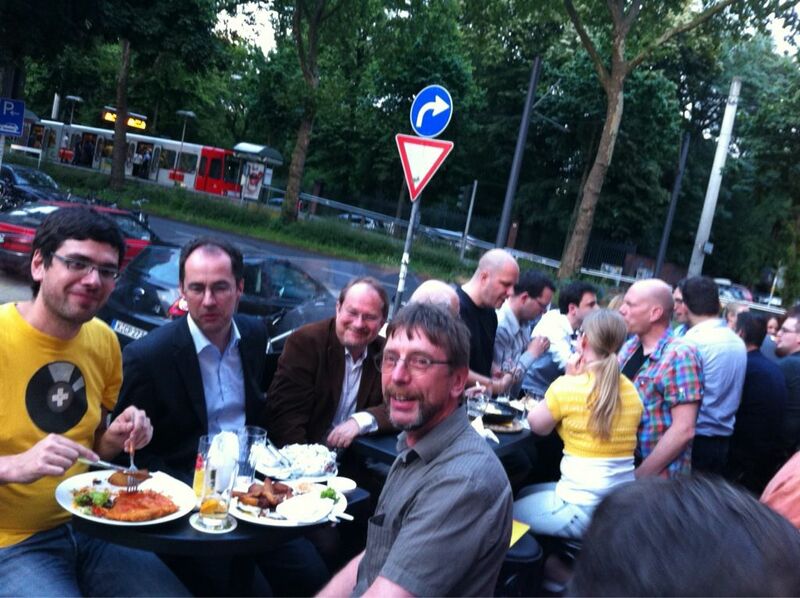 The second Cologne R user meeting took place last Friday, 6 July 2012, at the Institute of Sociology. Thanks to Bernd Weiß, who provided the meeting room, we didn't have to worry about the infrastructure, like we did at our first gathering. Again, we had an interesting mix of people turning up, with a very diverse background from chemistry to geo-science, energy, finance, sociology, pharma, physics, psychology, mathematics, statistics, computer science, telco, etc. Yet, the gender mix was still somewhat biased, with only one female attendee. We had two fantastic talks by Bernd Weiß and Stephan Sprenger. 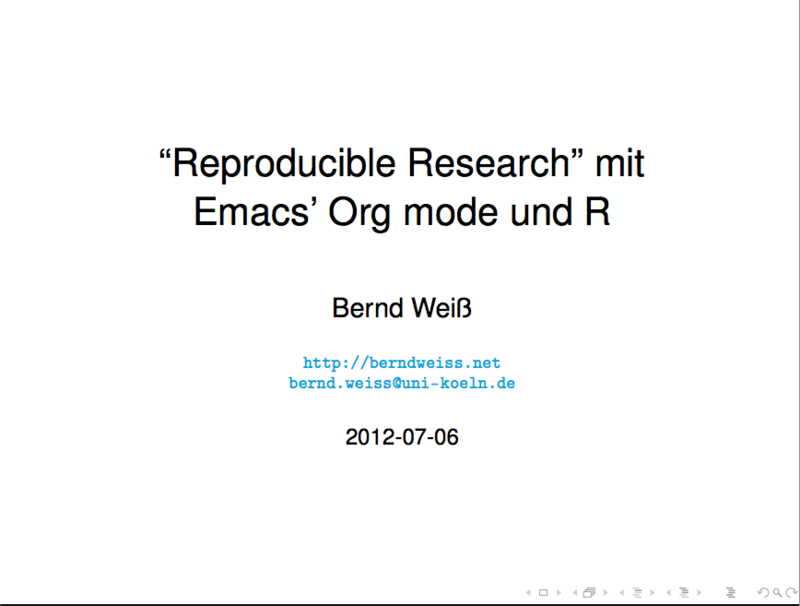 Bernd talked about Emacs' Org-Mode and R. He highlighted the differences between literate programming and reproducible research and if you follow his slides, you get the impression that Emacs with Org-mode is the all-singing-all-dancing editor, or for those who speak German: eine eierlegende Wollmilchsau. 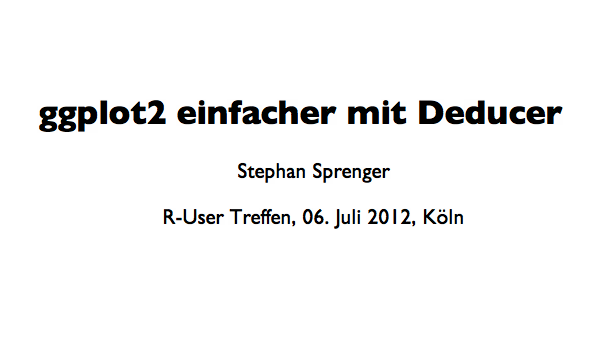 In the second talk Stephan presented the Deducer package. Deducer is an intuitive, cross-platform graphical data analysis system and works best with JGR. Stephan focused on Deducer as a graphical user interface to ggplot2. I believe most of us were in awe to see how easy it was with Deducer to generate ggplot2 charts and the underlying R statements. Stephan was brave enough to give live demos and to show that some of Deducer's power lies in its drag and drop user interface design. For more details see also his blog entry. At the end there was still time for a drink or two, and even some food (I know, some say: "Eating is cheating."). Luckily the weather was on our side, and we could enjoy our drinks in the beer-garden. The next meeting is scheduled in three month time at 5 October 2012. Watch out our Meetup site for further announcements.